1. 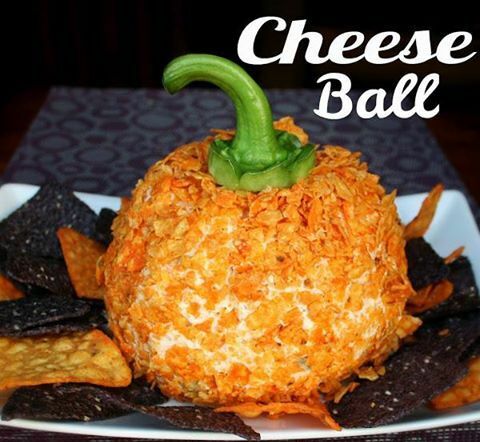 With a mixer, combine cream cheese, cheddar, onion, salsa and cumin. Mix until creamy. 2. Scoop mixture onto plastic wrap and use wrap to form a ball and chill for at least 2 hours. 3. When ready to serve, roll ball into the crushed nacho chips and place bell pepper stem on top. Serve with chips, vegetables or pretzels! So spooktacular, this sweet cemetery will have everyone digging for more! Prepare cake mix according to package directions using one 13 x 9-inch baking pan. Cool completely in pan. Invert cake onto serving platter. Frost cake, using a little more frosting than usual on top (“tombstones” will be pushed into frosting). Write spooky words such as “RIP” or “BOO” on Crunch bars using tube icing. Let sit for a few minutes to dry. Press Crunch bars into cake to create “tombstones”. Sprinkle chopped Butterfinger Crisp bar next to tombstones to create “dirt”. Creatively place gummy bugs over top of cake.